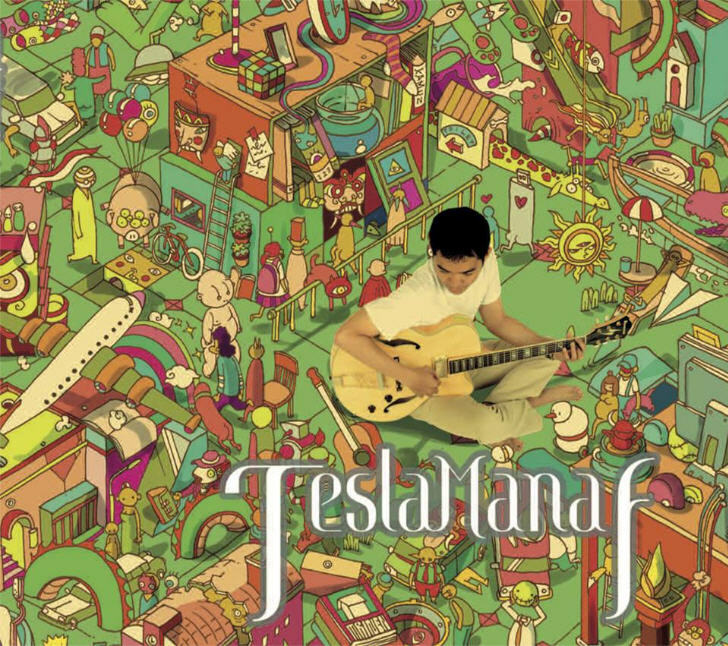 At hand is Indonesian guitarist and composer Tesla Manaf’s first international release, which reissues his 2014 album A Man’s Relationship with His Fragile Area, followed by his next earlier release from 2011 It’s All Yours. The opening title track is brief, a 44-second piece for jazz guitar with a female vocalist tracking the notes with lyrics in Indonesian; it’s an unusual piece, for sure, but also one that illustrates his brilliant outside-the-box approach to playing, composing and arranging. From that point the newer album settles out into a sound that fuses jazz and classical ideas into compositions that will surprise and inspire at every turn, while also integrating a measured amount of Indonesian traditional sounds into the mix. Manaf’s arrangements throughout the newer album include upright bass (Rudy Zulkarnaen), drums with a lighter touch (Desal Sembada), and masterfully played woodwinds (Hadis “Hulhul” Hendarisman) which include clarinet, Indonesian flute, and trompet pencak, the latter a sundanese instrument somewhat similar in timbre to a clarinet. Together this four-piece makes a gentle and expressive jazz informed by classical and chamber styles into compositions of varying lengths, some which may vaguely recall some of the artists in the 70s and 80s ECM camp. “Multiply by Zero” is one unusual more-or-less solo piece with double-tracked guitar and percussion sounding a bit like some early Larry Coryell endeavors. Throughout, one hears the guitar tying the work together, with the woodwinds often taking the lead melodic voice as opposed to more conventional soloing. “The Sweetest Horn” closes the album nicely in a more avant-chamber mode, with guitar and winds dueling off and on throughout the near-seven minute duration, with beautiful alternating solo interludes for both. The earlier album, It’s All Yours, is a six part jazz suite for guitar, upright bass, drums, keyboards, saxes, flute, voice, and a five-piece Balinese gamelan ensemble, the combination of which melds the ageless traditional sounds with the jazz ensemble. It’s an entirely different set of players than on the newer album. What’s amazing is just how well it all works together, the gamelan creating an interlocking percussive framework for the playful jazz creations to expand upon. Some of the sections are a bit more introspective and gentle, sans-gamelan, giving the guitar more expressive freedom, while others parts go more full-on with the traditional, even bringing in a kecak group (traditional Balinese chanting) at one point. This is a powerful blend of extremes, a beautiful mindblowing collision between the contemporary jazz idiom and the ancient sounds of Balinese theatrical tradition. All taken, this is an ambitious release that succeeds on every level, and although very different from the quartet work on the newer album, I’m pleased that Moonjune had the wisdom to include both albums on this first worldwide release.